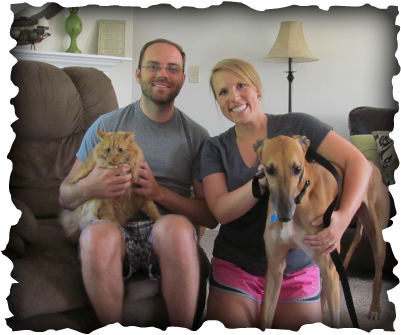 Rio Regall Grayson, now LEO was adopted by Suzann and Ryan of Florence, KY. First thing in the door, Blondie their sweet fuzzy cat greeted him, both a bit surprised to see each other, it won't be long until their are buddies. Leo is a gorgeous sweet boy and I know will enjoy all the attention he is going to receive. Suzann is a teacher so still has some time with him before heading back to work.